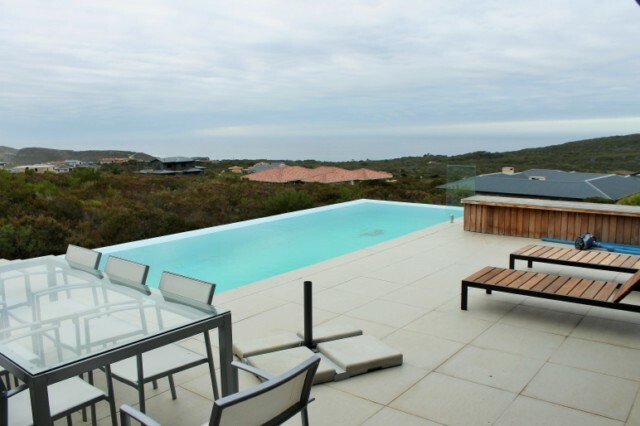 DISTANCE TO BEACH: Robberg Beach only 300 metres away. LOCATION & VIEWS: This 100 hectare estate is 7 km from the centre of Plettenberg Bay perched on a ridge enjoying unique vistas over the Indian Ocean, Tsitsikamma mountains and Robberg peninsula. This secure gated estate has taken great care to preserve the unique beauty and natural integrity of the area whilst providing a safe and harmonious environment. This two-storey house offers spacious, luxury accommodation with all the mod cons. The glass enclosed top section houses the open plan lounge (with TV & wood fire-place), kitchen (with inter-leading scullery) and dining area allowing for views, views, and views. Living area opens onto deck with rim-flow swimming pool and outside entertainment area. Inter-leading garage and guest toilet. Off the front section is a manicured garden with fire/braai pit. Main en suite bedroom (#1) is also on this level. Lower level is comprised of TV lounge with kitchen and 3 bedrooms/2 bathrooms opening into garden. - Salt water 1.8 metre deep rim-flow swimming pool; Not enclosed and has No cover/net. - Garage inter-leading parking for 1 vehicle. Uncovered off-street parking for 2 vehicles. - House is serviced 5 days a week, Mon-Fri (8am - 4pm), included in the rental. Servicing over weekends and public holidays is on request and for occupants account @ R250 per day. Occupants to supply housekeeper with breakfast, lunch and basic refreshments. - Weekly garden and pool service. - Gas braai & pit fire/braai.